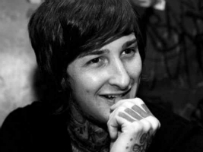 Metal music fans are in mourning as Mitch Lucker, lead singer of Suicide Silence, was pronounced dead yesterday. The singer died in a terrible motorcycle accident on Wednesday night in Huntington Beach, California. Lucker was only 28 years old. Huntington Beach Police released a statement saying Lucker had lost control of his motorcycle, a black 2013 Harley Davidson. It collided into a light pole at 8:55 p.m. and removed Lucker from his motorcycle seat. The motorcycle continued moving down the street and collided with a 2007 Nissan Titan truck. The truck had passengers in it and there were some trick-or-treaters near where the collision occurred, but no one was injured. The metal singer sustained several severe injuries and was treated on the scene. Huntington Beach Fire Department paramedics responded to the emergency and transported Lucker to the UCI Medical Center. He was pronounced dead at the hospital.